eAgronom is one of the fastest growing Estonian startups focused on bringing farmers to 21st century. We are young, crazy and our parties, well, let's say we had to move out from the city center! This time we are doing it together with sTARTUp Day and YOU are invited! Join this epic _Harvest party_ and dance yourself to delirium, enjoy mellow beats in shisha lounge, take nutcase photos in the hay and connect with the coolest people in sTARTUp world. You don't want to miss this crazy harvest party! There's a welcome drink for the early birds. Coctails and crafty stuff are served by Kolm Tilli for a modest fee throughout the night. PS: The party is for sTARTUp Day 2019 ticket owners. 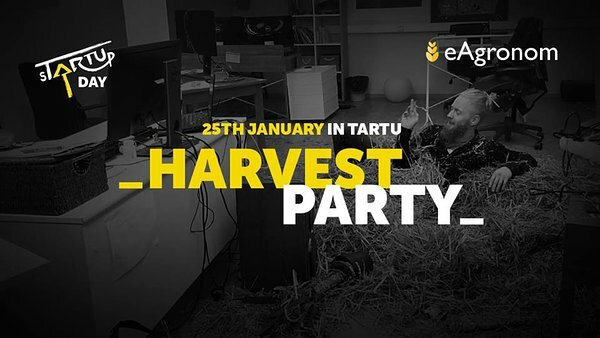 Harvest party at eAgronom is a side event of @sTARTUp Day 2019 – the biggest business festival in the Baltics, taking place on 23rd to 25th January 2019.